Before a single note has been sung, its pedigree alone tells you Matilda The Musical is going to deliver a quality night at the theatre. Based on Roald Dahl's novel, produced by the Royal Shakespeare Company (though as far away from Hamlet as you could get) and written by Dennis Kelly and Tim Minchin, this show was set up to win us over. 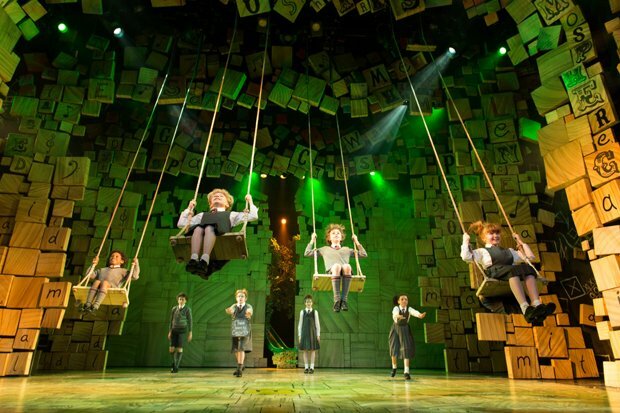 Whether it's playing in the West End, Broadway or on tour, Matilda is known for its strong casting – because when the success of your venture rests on the shoulders of a 10-year-old, you can't mess around. With four child casts rotating on this UK tour, there's little point in a name-check here, so suffice to say they're all brilliant. Dahl's lead character already had a place in our hearts – the fiercely intelligent daughter of two TV-obsessed, anti-book reading idiots who decides to make her own luck when she realises 'nobody else is going to put it right for me' (as she sings in her wonderful opening number, 'Naughty'). The goodie and baddie circulating her life, mean headmistress Miss Trunchball (a gift of a role for any male musical theatre performer, and played here by the excellent Elliot Harper) and gentle Miss Honey (the pure-voiced Carly Thoms) only make us root for her more. The storytelling makes us laugh and warms our heart, but it's the songs that really set this show apart – and if you don't enjoy 'When I Grow Up', with its inventive swing choreography and gorgeous harmonies, it's time to check your pulse. Reviewed at Playhouse Theatre, Edinburgh. The Royal Shakespeare Company presents Dennis Kelly and Tim Minchin's multi-award-winning musical adaptation of Roald Dahl's much loved tale about an extremely clever girl, who uses her extraordinary powers to free her classmates from the tyranny of sadistic headmistress, Miss Trunchbull. Directed by Matthew Warchus.